Chief Analytics Officer, Oct 2-5 in Boston, will be the largest, most senior gathering of analytics leaders in North America, providing a platform for over 300+ attendees and 125+ speakers to share best practice and explore strategies for driving actionable insights through analytics. Special KDnuggets offer - book by June 23. 2017 will be a critical year for analytics executives with a recent report stating that by 2018, more than half of large organizations globally will compete using advanced analytics and proprietary algorithms, causing the disruption of entire industries. 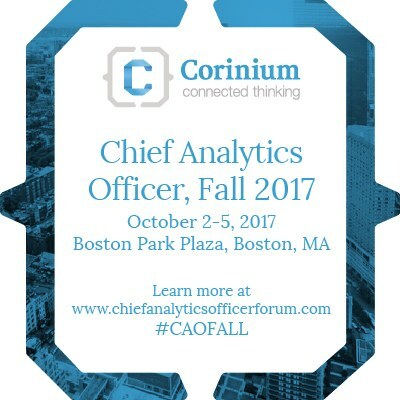 Against this backdrop, Corinium Intelligence are delighted to announce the return of the hugely anticipated Chief Analytics Officer, Fall 2017, (http://bit.ly/2tuAaYb) taking place from October 2-5 in Boston. This conference will be the largest, most senior gathering of analytics leaders in North America, providing a platform for over 300+ attendees and 125+ speakers to share best practice, accelerate analytics leadership and explore strategies for driving actionable insights through analytics. Take advantage of our summer deal to book your conference ticket for just *$1,000 USD for main conference, pre-conference day of your choice and post conference focus day. Just use code KD1000* at the end of the registrations process. *Disclaimer: The price mentioned above can only be availed by end-users. Vendors, solution providers, technology companies or any organizations that sell data or analytics solutions to the primary market need to register at vendor price mentioned on the website. Any vendor registering at the primary rate will automatically be charged at the vendor rate. CAO, Fall returns even bigger and better than ever in 2017, with over 125+ Speakers & 300+ Attendees. Dedicated Industry Focus Day’s for Healthcare, Financial Services & Insurance - Listen to case studies detailing cutting edge applications of analytics and how they are revolutionizing these traditional sectors. Brand New Location – The charm and contemporary elegance of the iconic Boston Park Plaza awaits. Enter a destination that has been the heart of Boston for 90 years. Corinium’s Signature Interactive Format & 27+ Hours of Networking – Roundtable Breakfasts, Dinners and Discussion Groups provide a highly-productive, intimate learning environment for you to extract maximum value for your time out the office. Plus the return of The Machine Learning, Deep Learning and AI for Strategic Innovation Focus Day - Hear about the exciting and innovative ways in which these technologies and processes are being used by forward thinking companies, to push the envelope. Take advantage of this great deal to book your conference ticket for just *$1,000 USD for main conference, pre-conference day of your choice and post conference focus day. Join over 300+ attendees for the largest most senior gathering of the of data leaders North America.